It’s been approximately two years since NVIDIA officially launched GeForce GTX 1060 graphics cards, both the 3GB and 6GB versions. As it was, the main aim was to counter the heat that came with the release of AMD Radeon RX 480 8GB and RX 480 4GB graphics cards. Even with the latest NVIDIA’s line up of graphics cards, the GeForce RTX 20-series, GTX 1060 graphics cards are still among the most powerful mid-range gaming video cards based on the NVIDIA Pascal architecture. GTX 1060 Graphics Cards command breakthrough gaming technologies, deliver brilliant performance and welcome you into the world of virtual reality and beyond. And compared to the previous gen cards, GTX 1060 graphics deliver 3X times better performance in speed and power efficiency. There are different versions of GTX 1060 Graphics Card by different manufacturers with varying memory clock speeds, bus width, aesthetics, cooling, and performance. If you’re a builder or would like to upgrade your graphics card, choosing one can be an uphill task. But we are here to help. We embarked on a research and the several hours we spent yielded. For a quick review, the comparison table sums it up. Read through the individual product reviews. A simple buyer’s guide provides the nitty-gritty of the GTX 1060 graphics cards. EVGA 6GB GeForce GTX 1060 is your most ideal graphics card for HD gaming. It commands high airflow with EVGA ACX cooling technology. The ACX coolers feature enhanced swept fan blades, dual ball bearings, and a remarkably low-power motor. EVGA precision and EVGA OC Scanner properties give the video card high overclocking capabilities. With a memory clock speed of 1506MHz that can be boosted to 1708MHz upon overclocking, the 6GB DDR5 VRAM and the 192 bits bus width, you’re set to enjoy a boost in performance. EVGA 6GB GeForce GTX 1060 is powerful enough to support up to 4 monitors. 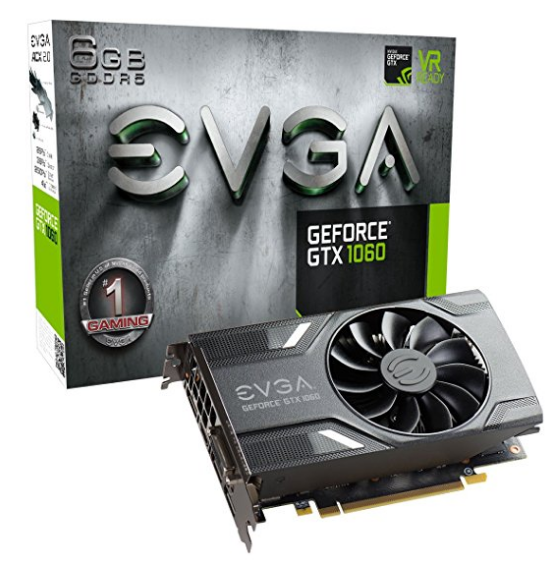 Packed with numerous innovative technologies and powered by NVIDIA Pascal, EVGA 6GB GeForce GTX 1060 is best perfect graphics card for HD gaming. It’ll be your gateway to the world of VR and beyond. EVGA 6GB GeForce GTX 1060 features EVGA ACX cooling technology with ACX coolers that bear enhanced swept fan blades, dual ball bearings, and an exceptionally low power motor. Expect more airflow with less power while making the best use of the extra GPU’s power. The card uses a single fan. What’s more, the card features EVGA precision and EVGA OC Scanner, both of which help unlock the power of the PASCAL technology. Take advantage of the resulting overclocking features and the inbuilt automatic overclock tuning to make the most of your graphics card. EVGA 6GB GeForce GTX 1060 boasts 1506MHz base clock speed and can hit 1708MHz with overclocking. Working hand in hand with the 192 bits memory bus width, the high clock speed keeps your system performing at peak. The graphics card supports 6GB DDR5, which greatly frees up your systems internal memory. As such graphics data get processed without bogging down the system. EVGA 6GB GeForce GTX 1060 graphics card will support up to 4 monitors. It connects to the motherboard via a PCI-E x 16 slot and requires 400W as the minimum power supply. Build upon NVIDIA Pascal architecture, ASUS 6GB GeForce GTX 1060 has been designed to deliver high-performance. In OC mode, the graphics card can achieve boost clock speeds as high as 1807MHz. ASUS 6GB GeForce GTX 1060 supports 6GB GDDR5 that greatly frees up the internal memory of your system and has 192 bits memory bus width. As such, you can be guaranteed high performance. ASUS 6GB GeForce GTX 1060 features dual-fan headers. As you’ll gather with time, a dual memory is better not only in making there’s more efficient cooling but also keeping the system’s noise levels down for quieter gameplay. With GPU Tweak II, it’s now easier than ever to keep track of the performance and streaming. Easily adjust the clock speed, voltages and fan speeds of your graphics card as you wish. Plus, you change the mode of the GPU Tweak II from standard to advanced mode based on your level of experience. The graphics card uses the premium Super Alloy II, a property that reduces power loss, lowers the buzzing of the system’s components and keep the internal temperatures manageable. ASUS 6GB GeForce GTX 1060 comes with dual HDMI ports that support VR. Using only the HDMI cables, you can immersive yourself in the world of virtual reality at any time. The graphics card connects to the motherboard via a PCI-E x 16 slot. Powered by NVIDIA Pascal architecture, EVGA 3GB GeForce GTX 1060 graphics card is your best alley for those high-definition games. There’s no better way to enter the world of VR gaming than with this video card. The card comes integrated with EVGA ACX cooling technology complete with ACX coolers featuring enhanced swept fan blades, double ball bearings, and an unbelievably low power motor. As a result, you can expect high airflow with less power consumption while taking advantage of the additional GPU’s power. EVGA 3GB GeForce GTX 1060 features EVGA precision and EVGA OC Scanner. Both properties help to unlock the power of the PASCAL technology. Make the best use of the resulting overclocking features, as well as the inbuilt automatic overclock tuning to squeeze as much power as possible from your graphics card. What’s more, the video card has 1506MHz base clock speed and will reach 1708MHz upon overclocking. And with its 192 bits memory bus width, the memory clock speed makes sure your system performs at peak. EVGA 3GB GeForce GTX 1060 supports 3GB DDR5 VRAM, which although not so great, will help free up the internal memory of your build. The graphics can then be processed without a slow-down in performance. This card can support up to 4 monitors and will connect to your build via a PCI-E x 16 slot. It requires 400W of power supply. And for cooling purposes, EVGA 3GB GeForce GTX 106 uses a single fan. Powered by Pascal architecture, MSI Gaming 6GB GeForce GTX 1060 is a solid high-performance graphics card. It’s been robustly built with a strong metal back plate that renders the card extra tough. The card sports a TWIN FROZR II design complete with a matte black finish. MSI Gaming 6GB GeForce GTX 1060 supports gaming and other applications in UHD resolution, which renders 4X better crisp and detailed visuals compared to 1080p. Sit tight and enjoy a fluid gaming experience devoid of screen tearing and significantly reduced input lag. What's more, the card features TORX Fan design that guarantees high-pressure airflow while still maintaining low decibel levels for your gameplay. The Airflow Control Technology directs maximum air toward the TWIN FROZR VI heat pipes resulting in reduced temperatures and better gaming. Using the MSI Gaming App, a single click will get your system ready for VR. It works by tuning all the key components to high-performance such that other non-critical software applications and processes do not impact on your virtual reality experience. Build upon the popular Pascal architecture, ZOTAC GeForce GTX 1060 Mini promises extra-ordinary performances and outstanding gaming experiences. It comes equipped with ultrafast FinFET, the next-gen memory technologies and supports DirectX 12 features guaranteeing a huge leap in performance and power efficiency. You’re set to enjoy the most fluid and fastest gaming experiences. The gaming card has 6-pin PCI-E 3.0 power connector and supports 6GB DDR5 VRAM. And with 192 bits bus width plus the 8008MHz memory clock speed, this graphics card is poised to boost your system’s performance. ZOTAC GeForce GTX 1060 Mini is optimized for gaming with the latest NVIDIA GameWorks technologies that deliver the smoothest gameplay and true-to-life experiences even in VR. The 360° image capture is just revolutionary. For faster and smooth image rendering, the graphics card features 1280 CUDA cores. And with 1506MHz base clock speed which hits 1708MHz with overclocking, the cards promises reasonably high performance. Equipped with Icestorm cooling technology, the card makes sure your system strikes a balance between the airflow and downward pressure such that your system stays chill and runs silently. It features dual-wide 90mm blade fans capable of ensuring large airflow and effective system cooling. ZOTAC GeForce GTX 1060 Mini features VRWork technology, a property that gets you immersed in the virtual reality world. Is there any better way to catch every sound and visual effects in real-time? What’s more, the card has an excellent connection profile with 3 DisplayPort 1.4, HDMI 2.0b & Dual-Link DVI. Also included is a quad simultaneous display cable. Build on the revolutionary NVIDIA Pascal GPU architecture, Gigabyte GeForce 3GB GTX 1060 WindForce brings with it superior performance & power efficiency. Gigabyte GeForce 3GB GTX 1060 WindForce will usher you into the VR world. It can support up to 8K displays at 60Hz. It supports 3GB DDR5 VRAM, has 192 memory bus width and 8008 clock speed, all pointing to a high-performance graphics card. The card connects to the motherboard via a PCI-E x16 and requires up to 400W of power. The graphics card uses WINDFORCE 2X cooling system with dual 90mm blade fans as well as dual copper heat-pipes. An alternate spinning fan design optimizes the airflow and heat pipes use direct touch technologies guaranteeing low turbulence and high heat dissipation. An LED indicator notifies of the fan status. For low power gaming, the LED indicator remains off if you have the GPU is under a set load or temperature. Gigabyte GeForce 3GB GTX 1060 WindForce combines high-performance and beauty. It comes integrated with RGB lighting that you can customize using XTREME Engine utility through the 16.7M color options and varying lighting effects. If you’re looking for an excellent graphics card that can support 1080p gaming, then PNY NVIDIA 6GB GeForce GTX 1060 comes highly recommended. It’s robustly built with an anodized back plate. PNY NVIDIA 6GB GeForce GTX 1060 is factory overclocked and has undergone stringent testing measures not only to boost the speed but also lower power consumption. No extra software is required to get it working. Besides, the graphics card takes pride in its 6GB DDR5 VRAM which frees up the internal memory. And with 192 bits bus width and 8008MHz memory clock speed, the video card is set to boost the performance of your built. It'll connect to the motherboard via PCI-E x16. The graphics card commands a dual fan design with 3” XLR8 fan cooler crafted to keep the GPU and the entire system cool under even under intense operations. Plus, the cooler has sleek red LEDs that’ll keep your system looking great. What’s more, PNY NVIDIA 6GB GeForce GTX 1060 is VR ready. With it in your build, you’re set to immerse yourself fully into the world of virtual reality. Regarding price, we have some great news. The prices of the GTX 10-series graphics are coming down, which means you’ll definitely save a couple of bucks on your purchase. A GTX 1060 Graphics Card is quite affordable now and for a small budget, you’ll be in for 1440p gaming and VR. With this card, your system can support most of the AAA games. While popular applications will run reasonably well with the integrated graphics, even investing in the low-end graphics card will see your experience improve significantly. GTX 1060 graphics card can run most of the modern games in medium to high graphics settings. For the best details and high frame rates, you may have to bump up your budget to get a premium card beyond the GTX 1060. Perhaps the impact of the graphics card won’t be as noticeable on the 1080p monitors as it would on the 1440p and 4K resolution monitors. GTX 1060 graphics card is an excellent fit for the 1440p gaming. It’s important to understand that your monitor’s refresh rate and the presence of an adaptive syncing technology will also influence the choice of your graphics card. GTX 1060 comes in two variants, 3GB and 6GB. If you take part in real-time gaming and at high resolutions, says 1440p with the game settings at the highest, then you’d better with a 6GB GTX 1060 graphics card. Of course, you’d have to adjust the settings between low and medium if you want to play at 1440p and aim for a VR experience when using a 3GB GTX 1060 graphics card. 3GB GTX 1060 would be your best bet if you don’t plan on going beyond 1080p any time soon and are probably tight on budget. The three most common connector interfaces available on a graphics card are HDMI, DVI, and DisplayPort. VGA ports are rare and can be found in the dirt cheap video card models. These ports determine the refresh rate and resolutions at which visuals are delivered. Calculated in MHz, the clock speed has a significant impact on the performance of a particular graphics card. It can be either the base clock or boost clock. Or both. Clock speed influences the lag time and frame rate. NVIDIA refers to shader core as CUDA cores. Image delivery is faster and the smoother with an increase in the number of CUDA cores. It determines the number of memory chips that can be used on a particular graphics card. For instance, if a GPU features 128 bits bus, then it goes that it has 4 memory chips, each with a 32-bit wide bus. Dedicated graphics card generate lots of heat especially when high on load. As such, the graphics cards come with fan headers. You'll come across the single fan, dual fan and triple fan cards. Although cheaper and smaller than the rest, the single fan tends to be overworked the performance will still be wanting even with overclocking. The triple fans graphics card tend to be large and deliver much better cooling effectively improving the performance of your system. Such a graphics card will support overclocking very well. Please note that some graphics cards feature heat sink cooling mechanisms rather than using fans. That means they’ll even run quieter and smoother compared to a video card that uses a single or dual fan for cooling. A system's integrated graphics card will certainly support most of the basic applications and older games. But if you want even better graphics and improved system's performance, a dedicated graphics card will come in handy. GTX 1060 graphics card is among the most powerful of the GTX 10-series of graphics cards and it'll see your build performing at peak. Budget, VRAM, the connectors, clock speed, and bus width and cooling are just a few of the crucial considerations when choosing a GTX 1060 graphics card. With our guide, it should be easy to find an excellent GTX 1060 that'll boost your build.